Angel in the Sickroom: Just Bought A Violin! After hearing the anime Shingetsutan Tsukihime's music, I was more hyped into learning the violin. 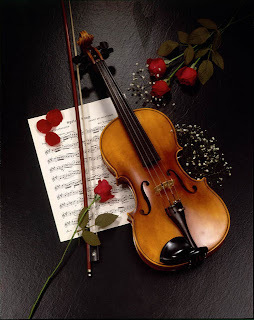 I find the music made by the violin as something soothing, mysterious, and just plain beautiful. I'd always wanted to learn to play the violin and how can I learn to play the violin if I didn't have my own violin right? Well so I got myself a violin today and I can't wait for it to arrive. I was going to buy this violin that cost only around $75 CAN but it had no carrying case or anything but then I decided to buy the violin that cost only $195 US from another store. I bought it because it seemed worth it for a begginner violin as it had all the accessories plus it was originaly priced at $800 US. I wanted to look for a cheaper starter violin since I might not be that good or I might not even learn violin so I didn't want to waste my money. But I failed to consider that the US $ is stronger than the Canadian $ so instead of paying $195, I actually paid for $250 Canadian. This factor even made me want to learn violin more as I don't intend to waste my money. I really hope that I do get to learn violin. I know that it would take patience, time, and practice, practice, and more practice.